A couple weeks ago, Tina and I had dinner at the E&O Trading Company in San Jose, CA. We found the restaurant to be a noisy, up-scale, Southeast Asian fusion restaurant that did not serve exceptional food. (Most of the food was high quality and very tasty, but you can get similar meals at a Thai or Malaysian restaurant for a third of the price.) 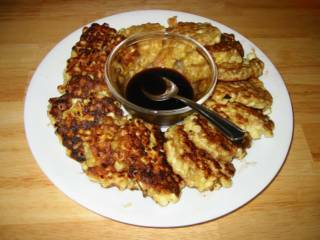 One dish that did stand out was their Indonesian Corn Fritters which was served with a spicy soy sauce. I decided to make this dish at home for about a dollar. 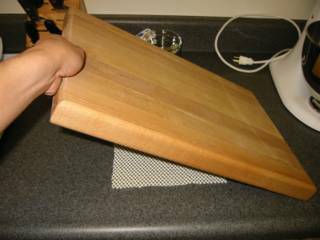 I place a piece of shelf liner under my cutting board to keep it from moving. I prefer this to a wet towel. Cut the kernels off the corn a few rows at a time. We're trying to preserve the kernals, so cut a little deep. 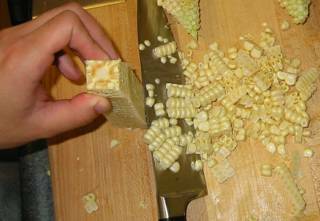 Run the back of the knife or your board scraper against the cob to extract the remaining bits of corn. We're looking for about 2-1/2 cup of corn. 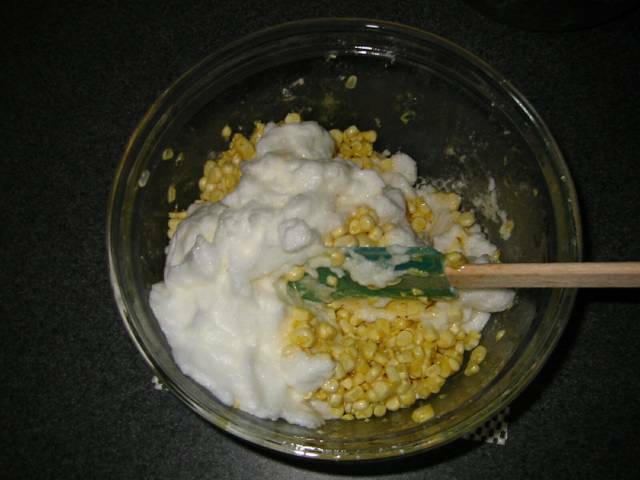 Canned sweet corn that's been drained will also work fine. We'll also need (from top left, clockwise), two large egg yolks, two large egg whites, 1 tablespoon granulated sugar, 1/4 teaspoon salt, 1/8 teaspoon pepper, and 2 tablespoons all purpose flour. Beat the egg whites in a large bowl with a whisk. You can also use your stand mixer or hand mixer with a whisk attachment. I placed the bowl on a piece of shelf liner to keep it from moving. A towel rolled and twisted into a donut also works well. You're done beating the egg whites once you achieve stiff peaks. 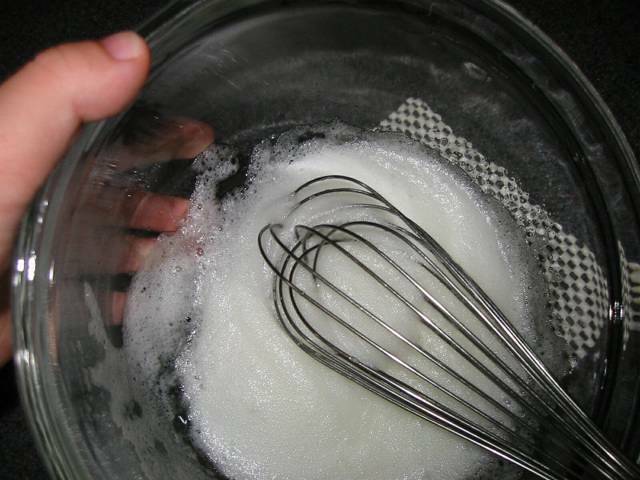 Just dab your whisk into the whites and lift. If the egg white form points that don't droop down, then you've got stiff peaks. (If they droop then it's called soft peaks.) 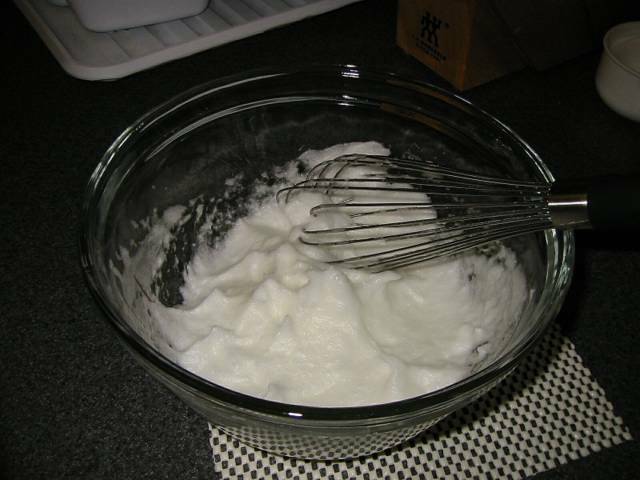 Stop whisking now, or you'll dry out the egg whites. Lightly beat the egg yolk and then mix into the corn. Add flour, salt, pepper, and sugar and mix. 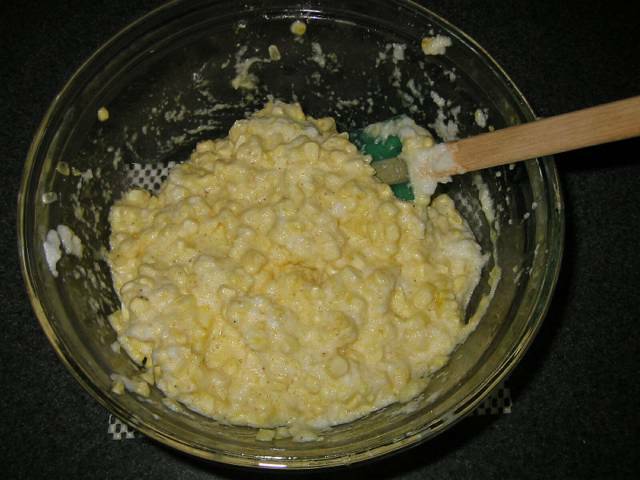 Fold in the egg whites into the corn mixture. This is what the final mixture looks like. Once they browned, about 2 to 3 minutes, I flipped them over and browned the other side. A larger pan would have helped speed things up, but I still managed to make about sixteen fritters fairly quickly. I fashioned a quick sauce out of Sriracha chili sauce, soy sauce, and sugar. I also made the fritters with varying degrees of brownness and determined that dark or light brown did not have adverse affects on taste. Wow, I had exactly the same thought when I ate there: good fritters, and nothing else worth the cash. :) Thanks for the recipe...I plan to make it soon. Love your site! This is the first tme I visit your blog. I'm really impressed in yours, your blog is so helpful and awesome. Michael, I think the correct spelling is "Sriracha" chili sauce (http://www.huyfong.com/no_frames/sriracha.htm). At least that's the one I usually use. If u cd add chopped shallots, celery leaves and a dash of white pepper to the corn mixture, it wd be tastier. hv lived in Indonesia, and cooked this very often. the recipe is for a basic american country style corn fritter,minus the pepper, and deep fried but with a different sauce. Americans use maple syrup, or honey, or common sweet syrup and butter. Glad to see another indigenous american thing went overseas. Sorry to see that another indigenous amercian thing lost credit for being what it is. Interesting asian sauce. is there any way to make these non fat?? you see, im belemic, but i still dont like eating fatty foods. any suggestions? I love the indonesian corn fritters. They are my favorite dish when I go to E&Os. However, I have yet to figure out how to make the chili soy sauce. I have played with a few ingredients (soy sauce, brown/white sugar, grated ginger, sambal olek, and sriracha) However, the sauce just isn't the same. I find that my sauce is much saltier than the E&O sauce. Any suggestions? By the way, I'm an engineer and I love the site. I love the pictures to show exactly what the steps look like. I am not an engineer, but my husband is. He'll appreciate this blog, too. I followed every inch of the directions to a T. Yet when I add the corn the mixture fails and it ends up a soupy mess. What am I doing wrong with these? Are you adding the corn to the mixture or folding the egg white mixture into the corn? The egg whites should be folded in. What is spicy soy sauce? Is this someting you mix up or purchase at the market? -- Thanks, nice site. Someone out there probably makes a spicy soy sauce, but in this case, I fashioned my own with Sriracha chili sauce, soy sauce, and a little sugar. I have no idea what E&O Trading Company uses for their dipping sauce - it tasted like soy sauce with a little kick to me. I seem to remember many restaurants and fairground vendors sprinkling powdered sugar on corn fritters. Does anyone else remember this or was this a limited regional thing? "the recipe is for a basic american country style corn fritter,minus the pepper, and deep fried but with a different sauce. Americans use maple syrup, or honey, or common sweet syrup and butter. Glad to see another indigenous american thing went overseas. Sorry to see that another indigenous amercian thing lost credit for being what it is." I assume by "american" you mean the USA. Corn in dough originated in South America, naturally, and variations of the corn-dumpling recipe appeared as soon as corn did, all over the world. Sauces and additions vary, but there was no "american credit" for this recipe to "lose". Love the blog, love the photos, thanks so much! I LOVE the flavor of Sriracha hot chili sauce, and would eat it by the spoonful if it wasn't so darned HOT (I know...I'm a wimp). 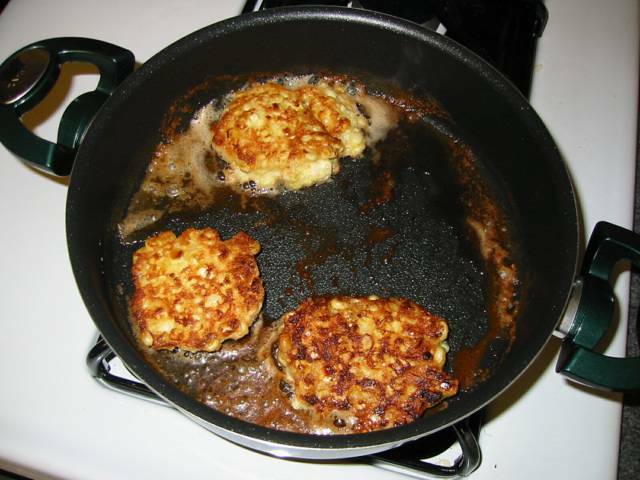 I don't think the fritters will fall apart if the oil is heated (350-375) for this delicate recipe). Try canola/veggie oil as it won't burn in high temperatures). 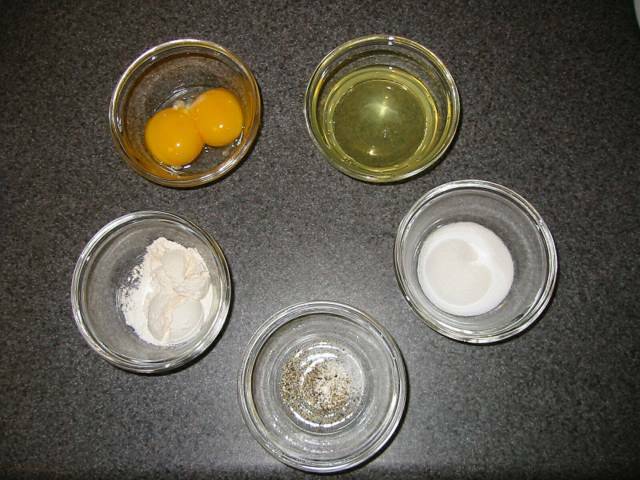 I've substitured cornstarch and it worked fine also and eliminated the other egg yolk to make it lighter. As for cooking this without the oil (miss belemic), just settle for the good ole grilled corn on the cob. Is the the corn that you're cutting off of the cob already cooked? Or is that raw corn that gets cooked in the frying process? It's raw corn getting cut from the cob. The corn cooks as it is pan fried. not that it should matter. it's not like raw corn is going to make you sick. Had to do a wiki to figure out that sriracha is the same as the "Rooster Sauce" you have on the table at a lot of Vietnamese and Thai restaurants. It's the best! I'm addicted to it, so easy to mix in with your scambled eggs, soups, spagetti, anything you want some heat in. For the "wimp" for whom it was too hot, I bet you could soften it's bite with some ketchup and/or roasted red pepper mashed up. I know that this recipe has been posted for a while but i just wanted to comment because I've made this recipe twice now and I'm very impressed, it is the best corn fritter recipe I've ever come across. I love the way it uses fresh rather than processed corn. I have a long drive to any place that stocks Sriracha sauce. I recently discovered that you can get it through amazon.com. What I mean is that when the fritters were frying in the pan some of the burning hot corn kernels popped and flew into the air. So there were flying corn kernels and spattering oil too. I had to cook "defensively" with a splatter guard! It was rather challenging. In the end, I had a great dish to put on the table and my family loved the fritters, but this kind of cooking certainly isn't for amateurs! Do you have any suggestions as to how to avoid this splattering problem? By the way, I didn't whisk the egg whites into peaks. I just used whole eggs plus egg whites and mixed them in. And I used raw corn and cooked shrimp too. ohterwise, I followed your recipe. Thanks for any suggestions you or anyone else might make. What I mean is that when the fritters were frying in the pan some of the burning hot corn kernels popped and flew into the air. They also served them with Chinese "ketsup" which is actually a very dark, very thick, sweet soy sauce. You can find it in most Asian groceries or markets. Man, I'm going to go heat up my fryer for these right now. Thanks. You're right. 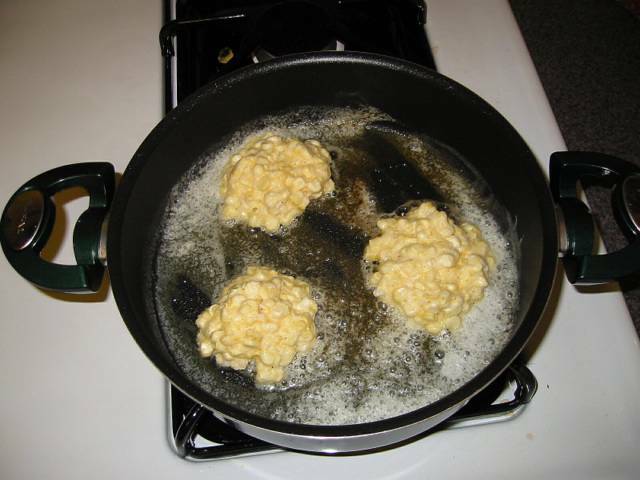 Using a lower temperature when frying the fritters (medium high instead or a higher temperature) cut down a LOT on the popping. I still felt safer using a splatter guard because of my previous experience. Thanks for the tip. Michael (or anyone with the answer), About how many ears of corn would I need for this? Also, I tend to use Dale's Sauce in place of soy sauce, so I dont have any on hand. I would appreshate any alternative dipping sauces anyone could suggest, please. I just made the corn fritters from the recipe. I followed the direction to a "T". They were great!!! The final batter did not look exactly like the picture. Mine looked white with corn kernels. It came out ok anyway. These came out great! I added some jalapenos for some extra kick. 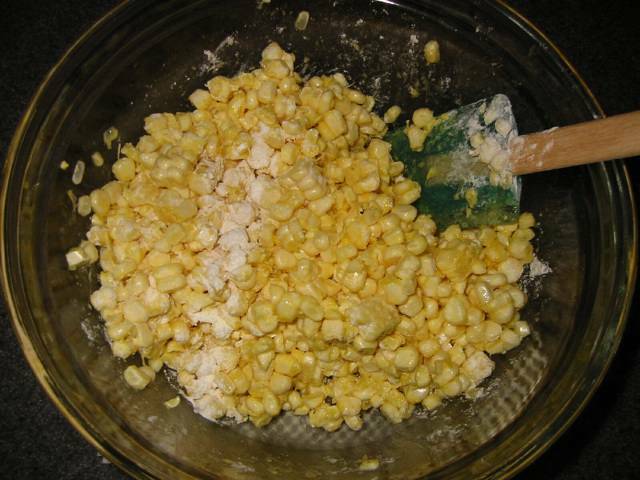 Also, I found if you use canned corn, increasing the flour to 1/4 cup helps a lot. i have been told, white vinegar can also be used to cut the heat. add a little at time and mix it well. something about the chemicals of vinegar inhibits the "hot" spices of the chili sauce or something. Hi, i'm from indonesia. In many families basicly "dadar jagung" or corn fritters or Fried Mashed Corn batter recipe made by grated corn or mashed it using cobek or you could use food processor , add some chopped chili(thai pepper), after you mashed it you can add chopped shrimp, flour, chopped shallot, pea(optional, my mom add it to make the colour more interesting), salt and white pepper. i like to eat mine with ketchup or ranch dressing. It seems there are several variation of this recipe - the version I know (my family is also from Indonesia) also uses whole corn kernels but the batter is made from flour, salt/pepper/chilli, turmeric and garlic (i.e. without eggs). Secondly: Your blog as a whole is great - thanks for presenting all those recipes and tips on your website! 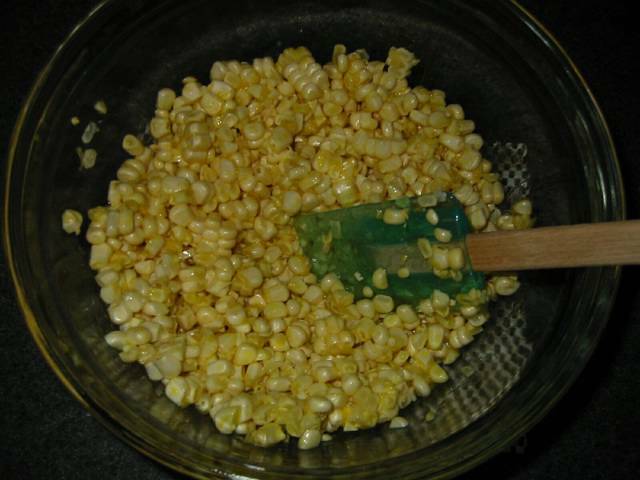 I was 1/2 cup shy on the corn, so I substituted onions, and it worked great. Nice and tasty. Also, whipping egg whites by hand is frakkin' hard. I have eaten these corn fritters at E&O Trading Co. and loved them and I plan to try making them this weekend. Would you be so kind as to give me the recipe for the dipping sauce? I'm not very good at experimenting. Thanks. I added a touch more flour along with a small handful of chopped spring onion and red pepper. For perhaps a bit of a healthier version, I fried them in a non stick pan with a touch of olive oil - perfect. I have not tried these yet, but if you are looking for a sweeter dipping sauce I would recommend adding rice wine vinegar to soy sauce (roughly 2/3 soy sauce and 1/3 vinegar). The rice wine vinegar adds sweetness, and cuts down on the saltiness. Here in Auckland, the Asian cafes make these with a delicious creamy sauce - simply sour cream with thai sweet chili sauce mixed in. Here's a spicy dipping sauce recipe I use when I make Shao Mai. Porbably work for the fritters too! Another way to enjoy corn fritters (which my family and I have enjoyed for many years...I am in my early 70s): as a dessert ! a dessert with maple syrup, or a syrup of your choice. YUMMY !!! Cooking for Engineers is the best-ever idea for a recipe/cooking site. Most people do not understand when I tell them to 'explain it in numbers or percentages' (math, the universal language). I am soooo glad you have developed this EASY TO UNDERSTAND cooking website! Thank You! and cooked at a low flame setting with almost no splattering. so a few quick cuts plus a few minutes of loosening the kernals gave us the base. Next time I'll add some of the other suggested ingredients. i would add Hoisin sauce (or even duck sauce, oddly enough) to the soy sauce you made and ditch the sugar. Hoisin is great on everything. Diced (1/4") jalapeno to the fritters, and Maple syrup for the sweetener in the sauce. I made my first batch of corn fritters when I was 8 years old - fresh corn, a bit of corn meal in the flour, sweetened egg whites, fried in lard, served with maple syrup. Never had them any other way till I was 40. I make them a dozen different ways from a dozen different recipes. How can you go wrong in August when the corn is so sweet and fresh? Lately I've been adding some smoked paprika, and serving them topped with avocado slices, hot salsa and sour cream. Heaven. And as long as the oil is hot and the cornmeal and flour are on the counter, why fry up some green tomatoes and eggplant slices? Peel and slice eggplant into 3/4" slices, salt on both sides and stand on edges in a colander. drain in sink for 20 mins. Pat dry, dip in beaten egg, then the same flour/cornmeal mixture. Fry in oil or fat that only comes half way up the slices (very important!). Turn with a slotted spoon. Do the green tomatoes the same, but lightly salt, set on a paper towel for a minute before you egg dip. Don't check your cholesterol! Life is well lived in the kitchen!! Wow... What an interesting site you have here :D. I'm an engineer and fortunately also an Indonesian who lives in China. (I know what you guys are thinking...). Just wanted to give a bit opinion on the recipe. Usually we Indonesian made the corn fritters a bit more complicated. Some adds chilli, Or chopped green onions, or chopped prawns, or sometimes even prawn paste (we call it "terasi udang" in Indonesian). And we deep friednit actually. So do tell me if you make another test by adding some ingredients i proposed above! :D Good luck! You can use a cast iron griddle for more volume, placed over 2 gas burners or just a large cast iron skillet. This will prevent a lot of splatter and will keep them uniform, making them easier to flip. A properly seasoned pan will be pretty non-stick. Just last night I made Gouda and ham omelette with a pretty new skillet (never used, just received a single seasoning in addition to what came from the factory). It flipped easily and it cleaned up quickly under hot water with just a brass scouring pad. First mix the corn that is combed with celery and leeks into a container. Then enter the seasoning ingredient puree and add salt to taste to the mixture in the container before. Then enter the flour and 1 egg. Afterwards stir until everything is well blended. Add water little by little, until the dough so it thickens. Then fry the dough into a preheated oil, cook until done roughly the color is slightly golden brown. Bakwan corn ready to be served. Hello from Indonesia! What a surprise to see a Bakwan Jagung recipe in this site. Here in Indonesia, corn fritter is seldom enjoyed as a snack, more like side dish to your rice and full meal. Some part in Indonesia call it Perkedel Jagung. And another kind of perkedel you can make is Perkedel Kentang, or mushed potato fritter. We enjoyed it usually with some clear soupy dish including vermicelli, tomatoes, carrot, inside. I'd suggest you add some very small-chopped parsley in the dough, the taste works for me. If you want to enjoy it with soy sauce, put in some chopped small green chillies, shallots, and lemongrass, and a hint of lime juice, it might as well bring a fresh taste to balance the oily taste from the corn fritter. Anyway, thank you for sharing! Enjoy your Bakwan Jagung!